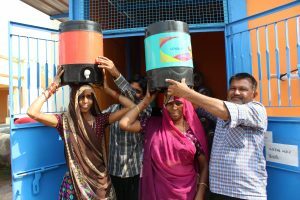 On November 26th 2018 we reached the milestone of selling 1 million litres of purified drinking water this year in the watershops installed in Gujarat, India. The water is sold to customers in and around Ahmedabad in watershops at price levels of around 1 euro cent per litre. Apart from reaching the 1 million litre production milestone, the system has also become financial sustainable. All operational and maintenance costs are covered with income related to water sales. 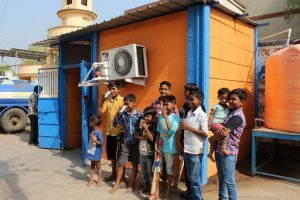 The watershop concept is successful party because we are also delivering–at an increased rate- chilled drinking water and ‘bulk drinking water’ for Indian festivals. 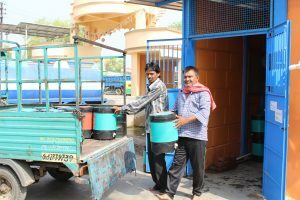 And to increase the convenience for our customers even more, the water can be delivered at their doorstep making use of the services of local rickshaw entrepreneurs willing to take care of the transportation at a slightly increased water price. Interested to learn how we could support you starting up your watershops program?